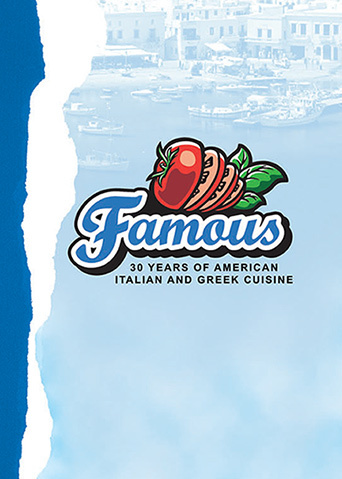 Famous Has Something Delicious for All! From lighter fare to platters, from American to Italian to Greek, you'll find a way to please your hunger. Start with a traditional appetizer, a Tsatsiki Dip or a flavor-filled Greek salad with our homemade house dressing. Then consider moving on to settle in with one of our family's Italian baked pastas served with toasted garlic bread or topping-filled 16-inch pizza. Perhaps today is the day you should dine on our family's Greek recipes and let your tastebuds travel to our native Greece. Comfort food from Famous also comes in those with traditional American flavors so perhaps today you need to have an award-winning sub or a filling burger with steak fries. Don't forget the children - we even serve cheesy macaroni and cheese. No matter what you or your guests' tastes are today, we can fill you with a delicious meal!